Does your carpet cleaner’s cleaner pass the “Shake Test? What is the “Shake Test” and what is the importance of it? The Shake Test is when you shake up the product(s) that are being used on your carpet. If you see, feel or hear it foam/suds up, the product is soapy. The importance of soap/foam on or in your carpet is that it will leave a sticky residue that will attract/hold dirt and debris causing dark, discolored carpet. Citrus Fresh Carpet Cleaning Atlanta has a video on THEIR website explaining this. We agree completely with this. We do NOT recommend using soapy or foamy products on your carpet. The product IN the video below is a bottle Citrus Fresh Carpet Cleaning left with a customer. As you can see in the video (at the 1:30 mark) the product is soapy, VERY soapy. We don’t know why Citrus Fresh Carpet Cleaning would educate customers on the problems with detergents that may be used by a carpet cleaner then actually GIVE them a bottle of it to use ON their carpet. But that certainly seems to be the case. Again, we suggest to everyone. 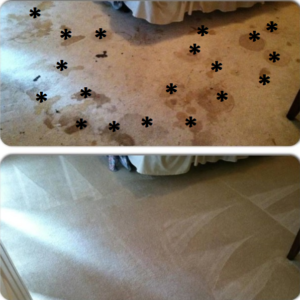 BEFORE you buy, purchase and certainly before you use a cleaner on your carpet, SHAKE it UP. You may notice as we have almost all carpet spot cleaners DO NOT come in clear bottles, but SOLID bottles you can’t see through. Coincidence? We don’t know. The perfectly round spots are from a SPOT BOT. No PER SPOT Fees, No Up-Sells!